So let’s say you have to analyze a company’s daily stock performance over the past 25 years. Quite a likely scenario when you are considering a serious investment or acquisition. But that’s 20,000 data points to analyze- fewer than the number of parts in most space stations! The trouble is, often the only way to visualize both the overall trends and the underlying details is to juggle around with a dozen charts and scrolling back and forth to decipher any meaningful insight. But what if you could get an overview across all your data and zoom right in to the details when you see an interesting trend? Introducing, the Zoom Line chart! In this post we will walk you through the zoom line chart, and show you how you can harness it to the best. The zoom line chart is probably the best application of this mantra. First off, this chart can handle a larger amount of data points than any other chart. 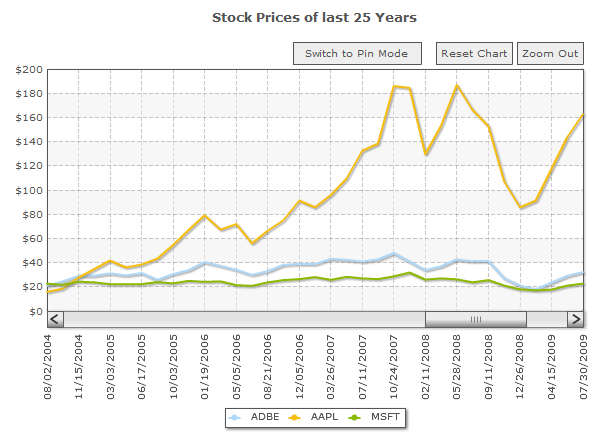 The example below has around 18 thousand data points of stock prices across 25 years. The entire data is compressed to fit the chart’s width, providing a quick overview . 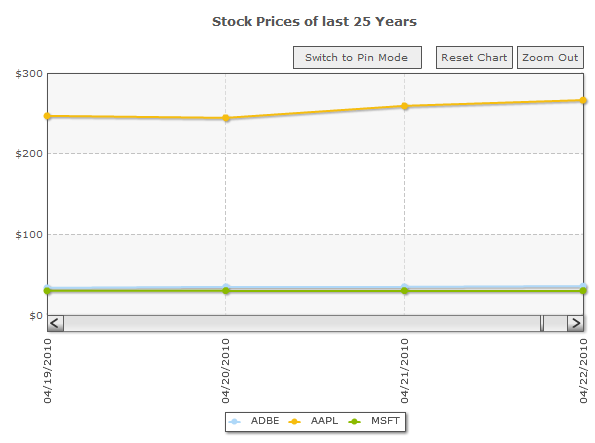 The zoom line chart also features information-packed tooltips. When you hover over a particular point on the overview, you can get the values and tips from all the data sets in that x-axis. To zoom into the details, you just have to select the range in the chart. Notice that the date range shown in the tooltips below the scroll bar. This shows you the data range that is currently selected. By default, the selection snaps to the nearest vertical divisional line for easy interaction. 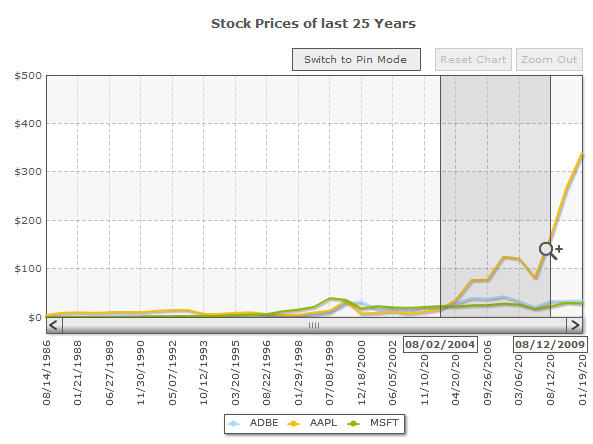 Once you release the mouse button, the chart zooms to show the selected range in the available space. That’s the beauty of the zoom line chart – you can zoom down all the way to view fluctuations by the day, or even minutes.. Pretty nifty, wouldn’t you say? But there’s more depth to the zoom line chart than just zooming. Lets say you want to compare the daily trends during September 2009 with that during September 2010. Since they’re far apart, you would have to compare them with your naked eye. Now you just need to select the target range- September 2009, in this case. The mouse pointer will turn to another icon upon releasing the mouse button. A ghost of the selected line segment gets imprinted on the canvas, thus letting you compare the pinned segment with the rest of the chart by just scrolling through. The pinned segment can be dragged to any part of the chart canvas. As you can see, the Zoom Line chart proves very useful in making sense of large datasets, especially when you want to see the overall trends and the minute patterns simultaneously. While the Zoom Line chart will not be able to handle data in the realm of Big Data that is about a few gigabytes, it can handle about 20,000 data points quite easily. Creating a zoom line chart is similar to creating other multi-series charts. 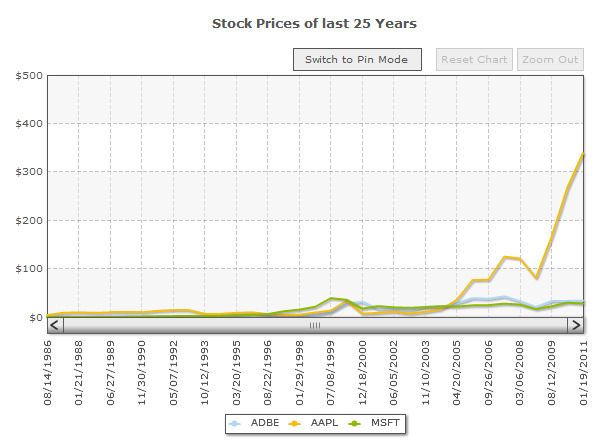 Let us walk through the process of creating a zoom line chart which plots the daily stock prices of Adobe (ADBE), Apple Inc. (AAPL) and Microsoft (MSFT) for the last 25 years. Then specify the [cciel lang=”xml”]<categories>[/cciel] for the chart, which in this case are the dates. And then you specify each of the datasets. 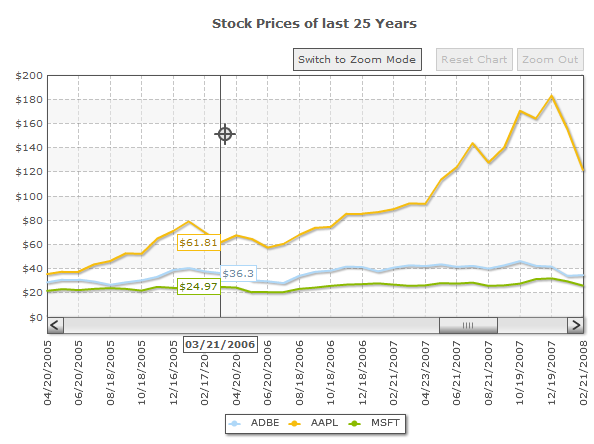 For this example, we have one dataset each for ADBE, AAPL and MSFT. 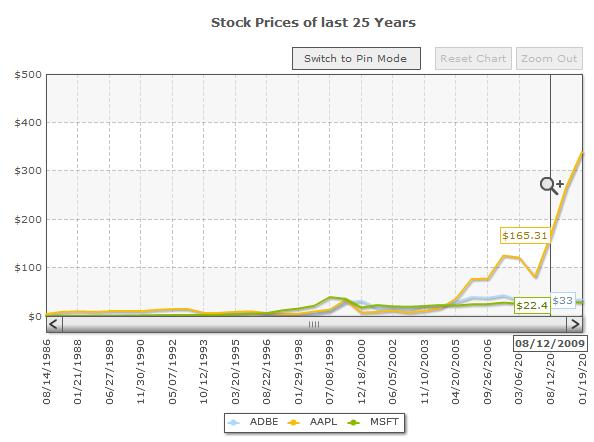 Within each datasets you [cciel lang=”xml”]<set>[/cciel] the value of the stock price for that date. With so many data labels on the X-axis, it gets difficult to see which data point lies on which date. To solve this problem, we’ve come up with Vertical divisional lines. These lines can be displayed on the chart canvas, above each data label. Enable them by declaring the [cciel lang=”xml”]showVDivLines=”1″[/cciel] attribute of the [cciel lang=”xml”]<chart>[/cciel]element. This readies your XML data for the chart. If you use the compact XML/JSON format, then don’t forget to include the [cciel lang=”xml”]compactDataMode=”1″[/cciel] and [cciel lang=”xml”]dataSeparator=”|”[/cciel] attributes in the [cciel lang=”xml”]<chart>[/cciel] element. 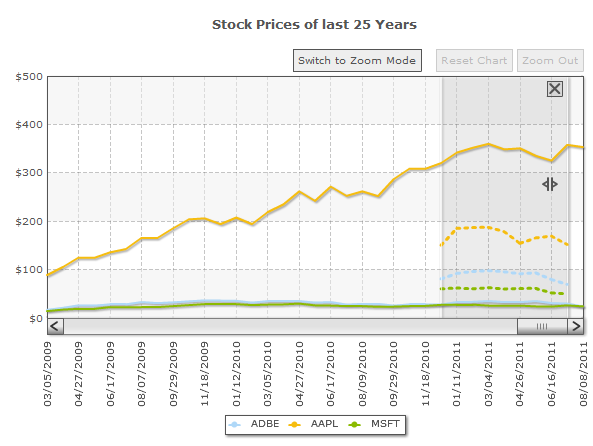 Download the sample zoom line chart we’ve showcased in this post. Dive into the massive but simple XML document to see its structure. The next time you encounter a situation where a large data set needs to be visualized, the zoom line chart would be a great fit. Your users will be delighted to interact with the data. And both of you could save time and effort of juggling between multiple charts. See more samples of the zoom line chart and go through the documentation. If you have some thoughts about the zoom line chart, or have an interesting use case where you’ve already used it, please let us know in the comments below. Next post: Yippie! We’re 9 today!